This name uses Eastern Slavic naming customs; the patronymic is Vladimirovich and the family name is Andropov. Yuri Vladimirovich Andropov (/ænˈdroʊpɔːf, -pɒf/; Russian: Ю́рий Влади́мирович Андро́пов, tr. Júrij Vladímirovič Andrópov, IPA: [ˈjʉrʲɪj vlɐˈdʲimʲɪrəvʲɪtɕ ɐnˈdropəf]; 15 June [O.S. 2 June] 1914 – 9 February 1984) was a Soviet politician and the fourth General Secretary of the Communist Party of the Soviet Union. Following the 18-year rule of Leonid Brezhnev, Andropov served in the post from November 1982 until his death in February 1984. Earlier in his career, Andropov served as the Soviet ambassador to Hungary from 1954 to 1957, during which time he was involved in the suppression of the 1956 Hungarian Uprising. Under the leadership of Leonid Brezhnev, he was named Chairman of the KGB on May 10, 1967. In this position, he oversaw a massive crackdown on dissent that was carried out via mass arrests and the wholesale application of involuntary psychiatric commitments of people deemed "socially undesirable". As Brezhnev's health declined during the latter years of his leadership, Andropov formed a troika alongside Foreign Minister Andrei Gromyko and Defense Minister Dmitry Ustinov that ultimately came to dominate Soviet policymaking. Upon Brezhnev's death on November 12, 1982, Yuri Andropov succeeded him as General Secretary and (by extension) leader of the Soviet Union. During his tenure, Andropov sought to eliminate corruption and inefficiency within the Soviet system by investigating longtime officials for violations of party discipline and criminalizing truancy in the workplace. However, upon suffering total renal failure in February 1983, Andropov's health began to deteriorate rapidly. On February 9, 1984, he died after leading the country for only 15 months. There has been much contention over his family background. According to the official biography, Andropov was born in stanitsa Nagutskaya (modern-day Stavropol Krai of Russia) on 15 June 1914. His father Vladimir Konstantinovich Andropov was a railway worker of Don Cossack descent who died from typhus in 1919. His mother Yevgenia Karlovna Fleckenstein (none of the official sources mentioned her name) was a school teacher who died in 1931. She was born in the Ryazan Governorate into a family of town dwellers and was abandoned on the doorstep of a Finnish citizen, a Jewish watchmaker Karl Franzevich Fleckenstein who lived in Moscow; he and his wife Eudokia Mikhailovna Fleckenstein adopted and raised her. Later researches has shown that many details about Andropov's biography were largely falsified during his lifetime which has contributed to the confusion connected to his family history. His earliest documented name was Grigory Vladimirovich Andropov-Fyodorov; he changed it to Yuri Andropov only several years later. While his original birth certificate disappeared, it was established that Andropov was in fact born in Moscow where his mother had been working in a women's gymnasium since 1913 throughout 1914 and until 1917. To make things more complicated, he named different dates of her death at various occasions: 1927, 1929, 1930 and 1931. The story of her adoption was also highly likely a mystification. In 1937 Andropov went through a check when applied for the Communist Party membership, and it turned out that "the sister of his native maternal grandmother" (he called her his aunt) who was living with him and who supported the legend of his Ryazan peasant origins was in fact his nurse who had been serving at Fleckensteins long before he was born. It was also reported that his mother belonged to merchantry. In fact Karl Fleckenstein was a rich jewel merchant, owner of a jewellery store, and so was his wife who took over her husband's business after his accidental death in 1915 (he was confused for a German during the infamous anti-German pogrom in Moscow, although Andropov preferred to refer to it as anti-Jewish). The whole family could've turned into lishentsy stripped of basic rights if she hadn't abandoned the store after another pogrom in 1917, invented herself a proletarian background and left Moscow for the Stavropol Governorate along with Andropov's mother. He gave different versions of his father's fate: in one case he divorced his mother soon after his birth, in another — died of illness. The "father" he referred to — Vladimir Andropov — was in fact his stepfather who lived and worked at Nagutskaya and died from typhus in 1919. The Fyodorov surname belonged to his second stepfather (since 1921) Viktor Fyodorov, a machinist assistant turned a school teacher. His real father remains unknown; he probably died in 1916 — a date written in Andropov's 1932 resume. During the 1937 check it was reported that his father served as an officer in the Imperial Russian Army. Andropov was thoroughly interviewed four times, yet he was so convincing that he managed to have dropped all charges. He joined the Communist Party in 1939. Komsomol membership card issued to Yuri Andropov in 1939. Andropov was educated at the Rybinsk Water Transport Technical College and graduated in 1936. As a teenager he worked as a loader, a telegraph clerk, and a sailor for the Volga steamship line. At 16, Yuri Andropov, then a member of the All-Union Leninist Young Communist League (YCL, or Komsomol), was a worker in the town of Mozdok in the North Ossetian ASSR. He became full-time Secretary of the YCL organization of the Water Transport Technical School in Rybinsk in the Yaroslavl Region and was soon promoted to the post of organizer of the YCL Central Committee at the Volodarsky Shipyards in Rybinsk. In 1938, he was elected First Secretary of the Yaroslavl Regional Committee of the YCL, and was First Secretary of the Central Committee of Komsomol in the Soviet Karelo-Finnish Republic from 1940 to 1944. According to the official biography, during World War II Andropov took part in partisan guerrilla activities in Finland, although modern researchers didn't manage to find any traces of his supposed partisan squad. From 1944 onwards, he left Komsomol for Communist Party work. Between 1946 and 1951, he studied at the university of Petrozavodsk. In 1947, he was elected Second Secretary of the Central Committee of the Communist Party of the Karelo-Finnish SSR. In 1951 Andropov was transferred to CPSU Central Committee. He was appointed an inspector and then the head of a subdepartment of the Committee. In July 1954, he was appointed Soviet Ambassador to Hungary and held this position during the 1956 Hungarian Revolution. Andropov played a key role in crushing the Hungarian uprising. He convinced a reluctant Nikita Khrushchev that military intervention was necessary. He is known as 'The Butcher of Budapest' for his ruthless suppression of the Hungarian uprising. The Hungarian leaders were arrested and Imre Nagy and others executed. After these events, Andropov suffered from a "Hungarian complex", according to historian Christopher Andrew: "He had watched in horror from the windows of his embassy as officers of the hated Hungarian security service [the Államvédelmi Hatóság or AVH] were strung up from lampposts. Andropov remained haunted for the rest of his life by the speed with which an apparently all-powerful Communist one-party state had begun to topple. When other Communist regimes later seemed at risk – in Prague in 1968, in Kabul in 1979, in Warsaw in 1981, he was convinced that, as in Budapest in 1956, only armed force could ensure their survival". Party identity card of Yuri Andropov one month before becoming a full member of the Politburo in April 1973. In 1957, Andropov returned to Moscow from Budapest in order to head the Department for Liaison with Communist and Workers' Parties in Socialist Countries, a position he held until 1967. In 1961, he was elected full member of the CPSU Central Committee and was promoted to the Secretariat of the CPSU Central Committee in 1962. In 1967, he was relieved of his work in the Central Committee apparatus and appointed head of the KGB on recommendation of Mikhail Suslov, at the same time promoted a Candidate Member of the Politburo. He gained additional powers in 1973, when he was promoted to full member of the Politburo. During the events of the Prague Spring in 1968, Andropov was the main advocate for "extreme measures" being taken against Czechoslovakia. According to classified information released by Vasili Mitrokhin, "[t]he KGB whipped up the fear that Czechoslovakia could fall victim to NATO aggression or to a coup". At this time, agent Oleg Kalugin reported from Washington that he gained access to "absolutely reliable documents proving that neither the CIA nor any other agency was manipulating the Czechoslovak reform movement". However his message was destroyed because it contradicted the conspiracy theory fabricated by Andropov. Andropov ordered a number of active measures, collectively known as operation PROGRESS, against Czechoslovak reformers. Throughout his career, Andropov aimed to achieve "the destruction of dissent in all its forms" and insisted that "the struggle for human rights was a part of a wide-ranging imperialist plot to undermine the foundation of the Soviet state". Towards this end, he launched a campaign to eliminate all opposition in the USSR through a mixture of mass arrests, involuntary commitments to psychiatric hospitals, and pressuring on rights activists to emigrate from the Soviet Union.These measures were meticulously documented throughout his time as KGB chairman by the underground Chronicle of Current Events, a samizdat publication which was itself finally forced out of existence with its last published issue, dated 30 June 1982. On 3 July 1967, he made a proposal to establish the KGB's Fifth Directorate for dealing with the political opposition:29 (ideological counterintelligence). :177 At the end of July, the directorate was established and entered in its files cases of all Soviet dissidents including Andrei Sakharov and Alexander Solzhenitsyn. In 1968, Andropov as the KGB Chairman issued his order "On the tasks of State security agencies in combating the ideological sabotage by the adversary", calling for struggle against dissidents and their imperialist masters. After the assassination attempt against Brezhnev in January 1969, Andropov led the interrogation of the captured gunman, Viktor Ivanovich Ilyin. Ilyin was pronounced insane and sent to Kazan Psychiatric Hospital. Later, on 29 April 1969, he submitted to the Central Committee of the Communist Party of the Soviet Union an elaborated plan for creating a network of psychiatric hospitals to defend the "Soviet Government and socialist order" from dissidents. :177 In January 1970 Andropov submitted an alarming account to his fellow Politburo members of the widespread threat of the mentally ill to stability and the security of the regime. The proposal by Andropov to use psychiatry for struggle against dissidents was implemented. :42 Andropov was in charge of the widespread deployment of psychiatric repression since he was the head of the KGB. :187–188 According to Yuri Felshtinsky and Boris Gulko, the originators of the idea to use psychiatry for punitive purposes were the head of the KGB (Andropov) and the head of the Fifth Directorate, Philipp Bobkov. The repression of dissidents included plans to maim the dancer Rudolf Nureyev, who had defected in 1961. There are some who believe that Andropov was behind the deaths of Fyodor Kulakov and Pyotr Masherov, the two youngest members of the Soviet leadership. A declassified document revealed that Andropov as KGB director gave the order to prevent unauthorized gatherings mourning the death of John Lennon. Andropov opposed the decision to intervene militarily in Afghanistan on 24 December 1979. Among his concerns was that the international community would blame the USSR for this action. The invasion led to the extended Soviet–Afghan War (1979–1989) and a boycott of the 1980 Summer Olympic Games in Moscow by 66 countries, something of concern to Andropov since spring 1979. On 10 December 1981, in the face of Poland's Solidarity movement, Andropov, along with Mikhail Suslov and Wojciech Jaruzelski, persuaded Brezhnev that it would be counterproductive for the Soviet Union to invade Poland by repeating Prague 1968. This effectively marked the end of the Brezhnev Doctrine. From 1980 to 1982, while still chairman of the KGB, Andropov opposed plans to occupy Poland after the emergence of the Solidarity movement and promoted reform-minded party cadres including Mikhail Gorbachev. Andropov was the longest-serving KGB chairman and did not resign as head of the KGB until May 1982, when he was again promoted to the Secretariat to succeed Mikhail Suslov as secretary responsible for ideological affairs. Andropov (seated second from right in the front row) presides over the USSR's 60th Anniversary shortly after succeeding Brezhnev as its leader. Two days after Leonid Brezhnev's death, on 12 November 1982, Andropov was elected General Secretary of the CPSU, the first former head of the KGB to become General Secretary. His appointment was received in the West with apprehension, in view of his roles in the KGB and in Hungary. At the time his personal background was a mystery in the West, with major newspapers printing detailed profiles of him that were inconsistent and in several cases fabricated. At home, Andropov attempted to improve the nation's economy by increasing its workforce's efficiency. He cracked down on Soviet laborers' lack of discipline by decreeing the arrest of absentee employees and penalties for tardiness. For the first time, the facts about economic stagnation and obstacles to scientific progress were made available to the public and open to criticism. Furthermore, the KGB Chairman-turned-Gensek gave select industries greater autonomy from state regulations and enabled factory managers to retain control over more of their profits. Such policies resulted in a 4% rise in industrial output and increased investment in new technologies such as robotics. Despite such reforms, Andropov refused to consider any changes that sought to dispense with the command economy introduced under Joseph Stalin. In his memoirs, Mikhail Gorbachev recalled that when Andropov was the leader, Gorbachev and Nikolai Ryzhkov, the chairman of Gosplan, asked him for access to real budget figures. "You are asking too much," Andropov responded. "The budget is off limits to you." In contrast to Brezhnev's policy of avoiding conflicts and dismissals, he began to fight violations of party, state and labour discipline, which led to significant personnel changes during an anti-corruption campaign against many of Brezhnev's cronies. During 15 months in office, Andropov dismissed 18 ministers and 37 first secretaries of obkoms, kraikoms and Central Committees of Communist Parties of Soviet Republics, and criminal cases against high level party and state officials were started. A photograph of Korean Air Lines HL7442, the airliner shot down by Soviet aircraft after drifting into prohibited airspace during the KAL 007 Flight. In foreign policy, the conflict in Afghanistan continued even though Andropov—who now felt the invasion was a mistake—half-heartedly explored options for a negotiated withdrawal. Andropov's rule was also marked by deterioration of relations with the United States. During a much-publicized "walk in the woods" with Soviet dignitary Yuli Kvitsinsky, American diplomat Paul Nitze suggested a compromise for reducing nuclear missiles in Europe on both sides that was ultimately ignored by the Politburo. Kvitsinsky would later write that, despite his own efforts, the Soviet leadership was not interested in compromise, instead calculating that peace movements in the West would force the Americans to capitulate. On 8 March 1983, during Andropov's reign as General Secretary, U.S. President Ronald Reagan famously labeled the Soviet Union an "evil empire". The same month, on 23 March, Reagan announced the Strategic Defense Initiative. Reagan claimed this research program into ballistic missile defense would be "consistent with our obligations under the ABM Treaty". However, Andropov was dismissive of this claim, and said that "It is time they [Washington] stopped ... search[ing] for the best ways of unleashing nuclear war. ... Engaging in this is not just irresponsible. It is insane". In August 1983, Andropov made an announcement that the country was stopping all work on space-based weapons. One of his most notable acts during his short time as leader of the Soviet Union was in response to a letter from a 10-year-old American child from Maine named Samantha Smith, inviting her to the Soviet Union. Meanwhile, Soviet–U.S. arms control talks on intermediate-range nuclear weapons in Europe were suspended by the Soviet Union in November 1983 and by the end of the year, the Soviets had broken off all arms control negotiations. Cold War tensions were exacerbated by Soviet fighters downing a civilian jet liner, Korean Air Flight KAL-007, which carried 269 passengers and crew, including a congressman from Georgia, Larry McDonald. KAL 007 had strayed over the Soviet Union on 1 September 1983 on its way from Anchorage, Alaska, to Seoul, South Korea. Andropov was advised by his Defence Minister Dmitriy Ustinov and by the head of the KGB Viktor Chebrikov to keep secret the fact that the Soviet Union held in its possession the sought-after black box from KAL 007. Grave of Andropov at the Kremlin Wall Necropolis, Moscow. In February 1983, Andropov suffered total renal failure. In August 1983, he entered the Central Clinical Hospital in western Moscow on a permanent basis, where he would spend the remainder of his life. In late January 1984, Andropov's health deteriorated sharply and due to growing toxicity in his blood, he had periods of falling consciousness. He died on 9 February 1984 at 16:50 in his hospital room at age 69. Few of the top Soviet leaders, not even all the Politburo members, learned of his death on that day. According to the Soviet post mortem medical report, Andropov suffered from several medical conditions: interstitial nephritis, nephrosclerosis, residual hypertension and diabetes, which were worsened by chronic kidney deficiency. A four-day period of nationwide mourning was announced. Andropov was succeeded by Konstantin Chernenko, who seemed to mirror Andropov's tenure. Chernenko had already been afflicted with severe health problems when he ascended to the USSR's top spot, and served an even shorter time in office (13 months). Like Andropov, Chernenko spent much of his time hospitalized, and also died in office, in March 1985. Andropov lived at 26 Kutuzovsky Prospekt, the same building in which Suslov and Brezhnev also lived. He was first married to Nina Ivanovna; she was born not far from the local farm in which Andropov was born. In 1983 she was diagnosed with cancer and underwent a successful operation. He met his second wife, Tatyana Filipovna, during World War II on the Karelian Front when she was Komsomol secretary. She had suffered a nervous breakdown during the Hungarian Revolution of 1956. Andropov's chief guard informed Tatyana about the death of her husband. She was too grief-stricken to join in the procession and during the funeral her relatives helped her to walk. Before the lid could be closed on Andropov's coffin, she bent to kiss him. She touched his hair and then kissed him again. In 1985, a respectful 75-minute film was broadcast in which Tatyana (not even seen in public until Andropov's funeral) reads love poems written by her husband. Tatyana became ill and died in November 1991. Andropov's legacy remains the subject of much debate in Russia and elsewhere, both among scholars and in the popular media. He remains the focus of television documentaries and popular non-fiction, particularly around important anniversaries. As KGB head, Andropov was ruthless against dissent, and author David Remnick, who covered the Soviet Union for the Washington Post in the 1980s, called Andropov "profoundly corrupt, a beast". Alexander Yakovlev, later an advisor to Mikhail Gorbachev and the ideologist of perestroika, said: "In a way I always thought Andropov was the most dangerous of all of them, simply because he was smarter than the rest." However, it was Andropov himself who recalled Yakovlev back to high office in Moscow in 1983 after a ten-year exile as ambassador to Canada after attacking Russian chauvinism. Yakovlev was also a close colleague of Andropov associate KGB General Yevgeny Primakov, later Prime Minister of Russia. Andropov began to follow a trend of replacing elderly officials with considerably younger replacements. In the West, if Andropov is remembered at all, it is for his brutal suppression of political dissidence at home and for his role in planning the 1968 invasion of Czechoslovakia. By contrast, the leaders of the former Warsaw Pact intelligence community, when I was one of them, looked up to Andropov as the man who substituted the KGB for the Communist party in governing the Soviet Union, and who was the godfather of Russia's new era of deception operations aimed at improving the badly damaged image of Soviet rulers in the West. Despite Andropov's hard-line stance in Hungary and the numerous banishments and intrigues for which he was responsible during his long tenure as head of the KGB, he has become widely regarded by many commentators as a reformer, especially in comparison with the stagnation and corruption during the later years of his predecessor, Leonid Brezhnev. Andropov, "a throwback to a tradition of Leninist asceticism", was appalled by the corruption during Brezhnev's regime, and ordered investigations and arrests of the most flagrant abusers. The investigations were so frightening that several members of Brezhnev's circle "shot, gassed or otherwise did away with themselves." He was certainly generally regarded as inclined to more gradual and constructive reform than was Gorbachev; most of the speculation centres around whether Andropov would have reformed the USSR in a manner which did not result in its eventual dissolution. The Western media favored Andropov because of his supposed passion for Western music and scotch. However, these were unproven rumours. It is also questionable whether Andropov spoke any English at all. The short time he spent as leader, much of it in a state of extreme ill health, leaves debaters few concrete indications as to the nature of any hypothetical extended rule. The 2002 Tom Clancy novel Red Rabbit focuses heavily on Andropov during his tenure of KGB chief, when his health is slightly better. It mirrors his secrecy in that British and American intelligence know little about him, not even able to confirm he was a married man. The novel also depicts Andropov as being a fan of Marlboros and starka vodka, almost never available to ordinary Soviet citizens. In a message read out at the opening of a new exhibition dedicated to Andropov, Vladimir Putin called him "a man of talent with great abilities." Putin has praised Andropov's "honesty and uprightness." According to Russian historian Nikita Petrov, "He was a typical Soviet jailer who violated human rights. Andropov headed the organisation which persecuted the most remarkable people of our country." From Petrov's point, it was a shame for the country that the persecutor of intelligentsia, the persecutor of freedom of thought, a man of whom as an oppressor of freedom legends were composed, became leader of the country. According to Roy Medvedev, the year that Andropov spent in power was memorable for increasing repression against dissidents. During most of his KGB career, Andropov crushed dissident movements, isolated people in psychiatric hospitals, sent them to prison and deported them from the Soviet Union. According to political scientist Georgy Arbatov, Andropov bears responsibility for many injustices in the 1970s and early 1980s: for deportations, for political arrests, for persecuting dissidents, for the abuse of psychiatry, for notorious cases such as the persecution of academician Andrei Sakharov. According to Dmitri Volkogonov and Harold Shukman, it was Andropov who approved the numerous trials of human rights activists such as Andrei Amalrik, Vladimir Bukovsky, Vyacheslav Chornovil, Zviad Gamsakhurdia, Alexander Ginzburg, Natalya Gorbanevskaya, Pyotr Grigorenko, Anatoly Shcharansky, and others. According to Soviet dissident Yuri Glazov, Andropov was a paradigmatic Homo Sovieticus and personally conducted disinformation campaigns against his main opponents and dissidents Andrei Sakharov and Alexander Solzhenitsyn. According to Natalya Gorbanevskaya, now for some reason, we usually say that after Andropov's coming to power dissident movement went into decline, as if it itself went into decline. The movement did not go into decline but was strangled. In the late 1970s and early 1980s, repression was most severe, a lot of people were picked up for a second time, and when you are taken away for a second time, then your term is longer, and the camp regime is not strict but specific, and when Andropov became General Secretary, he introduced an Article under which for violations of camp regime you could be put into not only to a punishment cell but received an additional term up to three years, that is a person for his two or three remarks could be sent not home but to another camp, with [non-political] criminals. And in those years there were a lot of deaths in camps not from hunger-strikes, but just from a disease, lack of medical care, etc. Various people who closely knew Andropov, including Vladimir Medvedev, Aleksandr Chuchyalin, Vladimir Kryuchkov and Roy Medvedev, remembered him for his politeness, calmness, unselfishness, patience, intelligence and exceptionally sharp memory. According to Chuchyalin, while working at Kremlin Andropov would read ca. 600 pages per day and remember everything he had read. Andropov read English literature and could communicate in Finnish, English and German. Jubilee Medal "50 Years Anniversary of the Mongolian Revolution"
Ленинизм озаряет наш путь [Leninism illumes our way] (in Russian). Moscow: Издательство политической литературы. 1964. Ленинизм — наука и искусство революционного творчества [Leninism is science and art of revolutionary creativity] (in Russian). Moscow: Издательство политической литературы. 1976. Коммунистическая убежденность — великая сила строителей нового мира [Communist firm belief is a great power of builders of new world] (in Russian). Moscow: Издательство политической литературы. 1977. "Доклад на торжественном заседании по случаю столетия со дня рождения Ф.Э. Дзержинского" [The report at the solemn meeting on the occasion of the centenary of F.E. Dzerzhinsky's birth]. Izvestiya (in Russian). 10 October 1977. Шестьдесят лет СССР: доклад на совместном торжественном заседании Центрального Комитета КПСС, Верховного Совета СССР и Верховного Совета РСФСР, в Кремлевском Дворце съездов, 21 декабря 1982 года [The sixty years of the USSR: a report of a joint solemn meeting of the CPSU Central Committee, the USSR Supreme Soviet and the RSFSR Supreme Soviet in the Kremlin Palace of Congresses, 21 December 1982] (in Russian). Moscow: Издательство политической литературы. 1982. "Text of Andropov's speech at Brezhnev's funeral". The New York Times. 16 November 1982. Speeches and writings. Oxford; New York: Pergamon Press. 1983. ISBN 978-0080312873. Selected speeches and articles. Moscow: Progress Publishers. 1984. ASIN B003UHCKTO. Speeches, articles, interviews. A Selection. South Asia Books. 1984. ISBN 978-0836411652. Учение Карла Маркса и некоторые вопросы социалистического строительства в СССР [The teaching of Karl Marx and some issues of socialist building in the USSR] (in Russian). Moscow: Издательство политической литературы. 1983. Ленинизм — неисчерпаемый источник революционной энергии и творчества масс. Избранные речи и статьи [Leninism is an inexhaustible source of revolutionary energy and creativity of masses. Selected speeches and articles] (in Russian). Moscow: Издательство политической литературы. 1984. Andropov, Y.V. (1995). "The birth of samizdat". Index on Censorship. 24 (3): 62–63. doi:10.1080/03064229508535948. This article incorporates text from a publication now in the public domain: "Biography of Yuri Andropov" (PDF). Soviet Life (323): 1B. 1983. Retrieved 19 August 2013. ^ "Andropov". Random House Webster's Unabridged Dictionary. ^ Aktürk, Şener (12 November 2012). Regimes of Ethnicity and Nationhood in Germany, Russia, and Turkey. Cambridge University Press. ISBN 978-1-139-85169-5. ^ a b c d A Dictionary of 20th Century Communism. Edited by Silvio Pons and Robert Service. Princeton University Press. 2010. ^ a b c d e f g Babichenko, Denis (3 October 2005). Легендарная личность [Legendary Personality]. Itogi (in Russian) (40): 30–34. ^ a b c d e f g h i j "Biography of Yuri Andropov" (PDF). Soviet Life (323): 1B. 1983. Retrieved 19 August 2013. ^ a b c d e f g Christopher Andrew and Vasili Mitrokhin, The Mitrokhin Archive: The KGB in Europe and the West, Gardners Books (2000), ISBN 0-14-028487-7. ^ "He may be an economic liberal, but Putin is an Andropov at heart". The Scotsman. 27 June 2004. ^ "A Chronicle of Current Events". A Chronicle of Current Events. ^ a b Nuti, Leopoldo (2009). The Crisis of Détente in Europe: From Helsinki to Gorbachev, 1975–1985. Taylor & Francis. p. 29. ISBN 978-0-415-46051-4. ^ a b Albats, Yevgenia (1995). KGB: state within a state. I.B.Tauris. p. 177. ISBN 978-1-85043-995-0. ^ "Eurasian Secret Services Daily Review". Axis Information and Analysis (AIA). 25 January 2009. Retrieved 29 April 2011. ^ McCauley, Martin (2014). The Rise and Fall of the Soviet Union. Routledge. p. 354. ISBN 978-1-31786-783-8. ^ Albats, Yevgenia (1995). KGB: State Within a State. London: I.B. Tauris. p. 191. ISBN 978-1-85043-995-0. ^ ""Report from Krasnodar Region KGB", 22 January 1970, Pb 151/XIII, The Bukovsky Archives: Communism on Trial". ^ Коротенко, Ада; Аликина, Наталия (2002). Советская психиатрия: Заблуждения и умысел (in Russian). Киев: Издательство «Сфера». p. 42. ISBN 978-966-7841-36-2. ^ Bloch, Sidney; Reddaway, Peter (1985). Soviet Psychiatric Abuse: The Shadow Over World Psychiatry. Westview Press. pp. 187–188. ISBN 978-0-8133-0209-6. ^ Felshtinsky, Yuri; Gulko, Boris (2013). The KGB Plays Chess: The Soviet Secret Police and the Fight for the World Chess Crown. SCB Distributors. ISBN 978-1936490011. ^ Letter by Andropov to the Central Committee (10 July 1970), English translation Archived 11 March 2007 at the Wayback Machine. ^ "Order to leave the message by Kreisky without answer; facsimile, in Russian. (Указание оставить без ответа ходатайство канцлера Бруно Крейского (Bruno Kreisky) об освобождении Орлова (29 июля 1983)" (PDF). ^ Seliktar, Ofira (2004). Politics, Paradigms, and Intelligence Failures: Why So Few Predicted the Collapse of the Soviet Union. M. E. Sharpe. p. 95. ISBN 978-0-7656-1464-3. ^ "Memorandum from the KGB Regarding the Planning of a Demonstration in Memory of John Lennon". Wilson Center Digital Archive. 20 December 1980. Retrieved 16 August 2013. ^ "The worsening situation in Afghanistan, Politburo meeting, 17-18 March 1979, The Bukovsky Archives: Communism on Trial". ^ Minutes of the CPSU Politburo meeting, 17 March 1979, in Russian. ^ "Andropov to Central Committee, 25 April 1979, "Anti-Soviet activities with regard to 1980 Olympic Games", The Bukovsky Archives: Communism on Trial". ^ Rutland, Peter; Pomper, Philip (17 August 2011). "Stalin caused the Soviet collapse". The Moscow Times. ^ Wilfried Loth. Moscow, Prague and Warsaw: Overcoming the Brezhnev Doctrine. Cold War History 1, no. 2 (2001): 103–118. ^ "The Andropov Hoax". Edward Jayepstein. Retrieved 30 March 2013. ^ Sakwa, Richard (1998). Soviet Politics in Perspective. Routledge. pp. 73–74. ISBN 978-0-415-16992-9. ^ Great Russian Encyclopedia (2005), Moscow: Bol'shaya Rossiyskaya Enciklopediya Publisher, vol. 1, p. 742. ^ Brown, Archie (1996). The Gorbachev Factor. Oxford University Press. pp. 64–65. ISBN 978-0-19-288052-9. ^ Sakwa, Richard (1998). Soviet Politics in Perspective. Routledge. p. 74. ISBN 978-0-415-16992-9. ^ Kort, Michael (2001). The Soviet Colossus:History and Aftermath. M.E. Sharpe. p. 315. ISBN 978-0-7656-0396-8. ^ Gorbachev, Mikhail (1996). Memoirs. Doubleday. p. 147. ISBN 978-0385480192. ^ Matlock, Jack F., Jr. (2005). Reagan and Gorbachev: How the Cold War Ended. New York: Random House. pp. 41–46. ISBN 978-0-8129-7489-8. ^ Kwizinskij, Julij A. (1993). Vor dem Sturm: Erinnerungen eines Diplomaten. Berlin: Siedler Verlag. ISBN 978-3-88680-464-1. ^ Church, George J. (1 January 1984). "Person of the Year 1983: Ronald Reagan and Yuri Andropov". TIME. Retrieved 2 January 2008. ^ Burns, John F. (11 February 1984). "ANDROPOV IS DEAD IN MOSCOW AT 69; REAGAN ASKS 'PRODUCTIVE' CONTACTS AND NAMES BUSH TO ATTEND FUNERAL". The New York Times. ISSN 0362-4331. Retrieved 11 July 2017. ^ a b c d Remnick, David, Lenin's Tomb:The Last Days of the Soviet Empire. New York; Random House, 1993, p. 191. ^ No Peter the Great. Vladimir Putin is in the Andropov mold, by Ion Mihai Pacepa, National Review, 20 September 2004. ^ Suny, Ronald Grigor, The Soviet Experiment: Russia, the USSR, and the successor states Oxford; Oxford University Press, 1998, p. 449. ^ Miletitch, Nicolas (29 July 2014). "Andropov birth centenary evokes nostalgia for Soviet hardliner". The Daily Star (Lebanon). ^ "Putin puts Yuri Andropov back on his pedestal". The Irish Times. 16 June 2004. ^ "Andropov birth centenary evokes nostalgia for Soviet hardliner". Gulf News. 29 July 2014. ^ a b Кара-Мурза, Владимир (10 February 2009). "Как изменилась оценка обществом ставленников спецслужб в госвласти со времен Андропова?" [How has society's assessment of security services proteges in state power changed since the time of Andropov?] (in Russian). Radio Liberty. ^ Cichowlas, Ola (2013). "In Russia, it is deja-vu all over again: how Russians fell back in love with the KGB and Stalin". The Polish Quarterly of International Affairs. 22 (2): 111–124. ^ Arbatov, Georgy (1992). The System: An Insider's Life in Soviet Politics. Times Books. p. 270. ISBN 978-0812919707. ^ Neimanis, George (Summer 1993). "The view from inside: A review essay". Journal of Baltic Studies. 24 (2): 201–206. doi:10.1080/01629779300000071. ^ Volkogonov, Dmitri; Shukman, Harold (1998). Autopsy for an empire: the seven leaders who built the Soviet regime. Simon and Schuster. p. 342. ISBN 978-0684834207. ^ Tismaneanu, Vladimir (18 August 2014). "Who was Yuri Andropov? Ideologue, policeman, apparatchik: why a deceased Soviet butcher has an ever-growing mini-cult following". FrontPage Magazine. ^ a b c d Кашин, Олег (22 May 2008). "Хроника утекших событий. Наталья Горбаневская: немонотонная речь" [A Chronicle of Past Events. Natalya Gorbanevskaya: non-monotonous speech]. Русская жизнь (in Russian). ^ Kryuchkov, Vladimir (2004). Личность и власть. ISBN 5-09-013785-4. ^ Medvedev, Vladimir (1994). Человек за спиной. Russlit. pp. 120–121. ISBN 5865080520. Beichman, Arnold; Bernstam, Mikhail (1983). Andropov, New Challenge to the West. Stein and Day. ISBN 978-0812829211. OCLC 9464732. Bialer, Seweryn (3 February 1983). "The Andropov succession". The New York Review of Books. Ebon, Martin (1983). The Andropov file: the life and ideas of Yuri V. Andropov, general secretary of the Communist Party of the Soviet Union. McGraw-Hill. ISBN 978-0070188617. Epstein, Edward (7 February 1983). "The Andropov hoax". The New Republic. Archived from the original on 25 February 2002. Glazov, Yuri (1985). "Yuri Andropov: a recent leader of Russia". The Russian mind since Stalin's death. D. Reidel Publishing Company. pp. 180–221. doi:10.1007/978-94-009-5341-3_10. ISBN 978-9027718280. Goodman, Elliot (Summer 1984). "The Brezhnev-Andropov legacy: implications for the future". Survey. 28 (2): 34–69. Granville, Johanna (2004). The first domino: international decision making during the Hungarian crisis of 1956. Texas A & M University Press. ISBN 978-1585442980. Gribanov, Alexander; Kowell, Masha (2009). "Samizdat according to Andropov". Poetics Today. 30 (1): 89–106. doi:10.1215/03335372-2008-004. Herman, Victor (September 1983). "In Stalin's footsteps: Yuri Andropov: rise of a dictator". Imprimis. Medvedev, Roy (1 January 1984). "Andropov and the dissidents: the internal atmosphere under the new Soviet leadership". Dissent. 31 (1): 97–102. "П.Л. Капица и Ю.В. Андропов об инакомыслии" [P.L. Kapitsa and Yu.V. Andropov about dissent]. Kommunist (in Russian) (7). 1991. Sayle, Timothy (August 2009). "Andropov's Hungarian complex: Andropov and the lessons of history". Cold War History. 9 (3): 427–439. doi:10.1080/14682740902764528. Solovyov, Vladimir; Klepikova, Elena (1983). Yuri Andropov: a secret passage into the Kremlin. Macmillan. ISBN 978-0026122900. Whelan, Joseph (1983). Andropov and Reagan as negotiators: contexts and styles in contrast. Congressional Research Service The Library of Congress. ASIN B00DDVND9I. Авторханов, Абдурахман (1986). От Андропова к Горбачёву: Дела и дни Кремля [From Andropov to Gorbachev: Deeds and days of the Kremlin] (in Russian). Paris: YMCA-PRESS. ISBN 978-2-85065-088-8. Cold War International History Project Bulletin, no. 5 (Woodrow Wilson Center for International Scholars, Washington, D.C.), Spring 1995, pp. 22–23, 29–34. Wikimedia Commons has media related to Yuri Andropov. The history of the Soviet Union from 1982 through 1991 spans the period from Leonid Brezhnev's death and funeral until the dissolution of the Soviet Union. Due to the years of Soviet military buildup at the expense of domestic development, economic growth stagnated. Failed attempts at reform, a standstill economy, and the success of the United States against the Soviet Union's forces in the war in Afghanistan led to a general feeling of discontent, especially in the Baltic republics and Eastern Europe. Konstantin Ustinovich Chernenko was a Soviet politician and the fifth General Secretary of the Communist Party of the Soviet Union. He led the Soviet Union from 13 February 1984 until his death thirteen months later, on 10 March 1985. 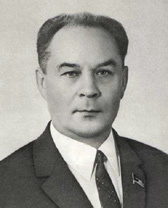 Chernenko was also Chairman of the Presidium of the Supreme Soviet from 11 April 1984 until his death. During its seventy-year history, the Soviet Union usually had a de facto leader who would not necessarily be head of state, but would lead while holding an office such as Premier or General Secretary. Under the 1977 Constitution, the Chairman of the Council of Ministers, or Premier, was the head of government and the Chairman of the Presidium of the Supreme Soviet was the head of state. The office of the Chairman of the Council of Ministers was comparable to a prime minister in the First World whereas the office of the Chairman of the Presidium was comparable to a president. In the ideology of Vladimir Lenin, the head of the Soviet state was a collegiate body of the vanguard party. Leonid Ilyich Brezhnev was a Soviet politician. The fifth leader of the Soviet Union, he was General Secretary of the Central Committee of the governing Communist Party of the Soviet Union (CPSU) from 1964 until his death in 1982. Ideologically, he was a Marxist-Leninist. General Secretary of the Central Committee of the Communist Party of the Soviet Union was an office of the Communist Party of the Soviet Union (CPSU) that by the late 1920s had evolved into the most powerful of the Central Committee's various secretaries. With a few exceptions, from 1929 until the union's dissolution the holder of the office was the de facto leader of the Soviet Union, because the post controlled both the CPSU and the Soviet government. Joseph Stalin elevated the office to overall command of the Communist Party and by extension the whole Soviet Union. Nikita Khrushchev renamed the post First Secretary in 1953; the change was reverted in 1966. The President of the Soviet Union, officially called President of the USSR or President of the Union of Soviet Socialist Republics, was the head of state of the Union of Soviet Socialist Republics from 15 March 1990 to 25 December 1991. Mikhail Gorbachev was the only person to occupy the office. Gorbachev was also General Secretary of the Communist Party of the Soviet Union between March 1985 and August 1991. He derived an increasingly greater share of his power from his position as president until he finally resigned as General Secretary after the 1991 coup d'état attempt. Andrei Pavlovich Kirilenko was a Soviet statesman from the start to the end of the Cold War. In 1906, Kirilenko was born at Alexeyevka in Belgorod Oblast to a Ukrainian working-class family. He graduated in the 1920s from a local vocational school, and again in the mid-to-late 1930s from the Rybinsk Aviation Technology Institute. He became a member of the All-Union Communist Party (bolsheviks) in 1930. As many like him, Kirilenko climbed up the Soviet hierarchy through the "industrial ladder"; by the 1960s, he was Vice-Chairman of the Bureau of the Central Committee of the Russian Soviet Federative Socialist Republic (RSFSR). After Nikita Khrushchev's forced resignation, Kirilenko became Leonid Brezhnev's "chief lieutenant" within the Central Committee. Mikhail Andreyevich Suslov was a Soviet statesman during the Cold War. He served as Second Secretary of the Communist Party of the Soviet Union from 1965, and as unofficial Chief Ideologue of the Party until his death in 1982. Suslov was responsible for party democracy and the power separation within the Communist Party. His hardline attitude toward change made him one of the foremost orthodox communist Soviet leaders. 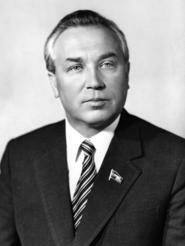 Dmitriy Fyodorovich Ustinov was a Marshal of the Soviet Union and Soviet politician during the Cold War. He served as a Central Committee secretary in charge of the Soviet military-industrial complex from 1965 to 1976 and as Minister of Defence of the Soviet Union from 1976 until his death in 1984. Yegor Kuzmich Ligachyov is a Soviet politician who was a high-ranking official in the Communist Party of the Soviet Union (CPSU). Originally an ally of Mikhail Gorbachev, Ligachyov became a challenger to his leadership. Nikolai Aleksandrovich Tikhonov was a Soviet Russian-Ukrainian statesman during the Cold War. He served as Chairman of the Council of Ministers from 1980 to 1985, and as a First Deputy Chairman of the Council of Ministers, literally First Vice Premier, from 1976 to 1980. Tikhonov was responsible for the cultural and economic administration of the Soviet Union during the late era of stagnation. He was replaced as Chairman of the Council of Ministers in 1985 by Nikolai Ryzhkov. In the same year, he lost his seat in the Politburo; however, he retained his seat in the Central Committee until 1989. Grigory Vasilyevich Romanov was a Soviet politician and member of the Politburo and Secretariat of the CPSU. In 1985, he was considered Mikhail Gorbachev's main rival in the succession struggle after the death of Konstantin Chernenko in March 1985, the third Soviet leader to die in just a few short years. Alexander Nikolayevich Shelepin was a Soviet politician and security and intelligence officer. A long-time member of the Central Committee of the Communist Party of the Soviet Union, he served as First Deputy Prime Minister, as a full member of the Politburo and as the Chairman of the KGB from December 1958 to November 1961. He continued to maintain decisive influence in the KGB until 1967; his successor as KGB Chairman, Vladimir Semichastny, was his client and protégé. Vladimir Alexandrovich Kryuchkov was a Soviet lawyer, diplomat and head of the KGB, member of the Politburo of the Central Committee of the CPSU. Fyodor Davydovich Kulakov was a Soviet-Russian statesman during the Cold War. On 10 November 1982, Leonid Ilyich Brezhnev, the third General Secretary of the Communist Party of the Soviet Union (CPSU) and the fifth leader of the Soviet Union, died aged 75, a month before his 76th birthday after suffering a heart attack following years of serious ailments. His death was officially acknowledged on 11 November simultaneously by Soviet radio and television. After five days of national mourning, Brezhnev was given a state funeral and then buried in the Kremlin Wall Necropolis. Yuri Andropov, Brezhnev's eventual successor as general secretary, was chairman of the committee in charge of managing Brezhnev's funeral, held on 15 November 1982, five days after his death. Nikolai Anisimovich Shchelokov was a Soviet statesman and Army General, who also served as interior minister for sixteen years from 17 September 1966 to 17 December 1982. He was fired from all posts on corruption charges and committed suicide on 13 December 1984. Collective leadership or Collectivity of leadership, was considered an ideal form of governance in the Union of Soviet Socialist Republics (USSR) and other socialist states espousing communism. Its main task was to distribute powers and functions among the Politburo, the Central Committee, and the Council of Ministers to hinder any attempts to create a one-man dominance over the Soviet political system by a Soviet leader, such as that seen under Joseph Stalin's rule. On the national level, the heart of the collective leadership was officially the Central Committee of the Communist Party. Collective leadership is characterised by limiting the powers of the General Secretary and the Chairman of the Council of Ministers as related to other offices by enhancing the powers of collective bodies, such as the Politburo.